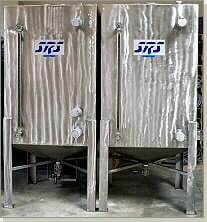 SRS Designed Equipment offers a series of standard Solvent Storage Tank(s) used in a variety of applications in cleaning and solvent distillation systems. 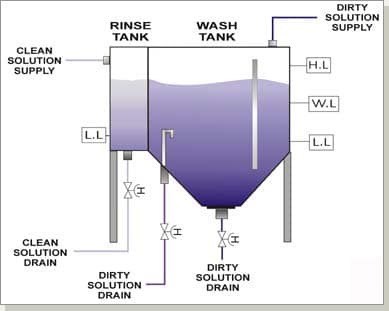 In cleaning and distillation applications where a high concentration of solids occur, SRS utilizes conical bottom designs to allow the heavier materials to collect at the bottom for easy removal, either through an automatic fill system in distillation applications or through transfer pumping systems to other locations. In cleaning applications, where the solvent is recirculated to the wash system, internal baffles are used to assist in the effective and maintenance free solids removal. Stainless steel is used in the construction of all SRS solvent or water storage tanks for optimal endurance, corrosion resistance and appearance. 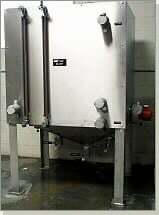 These tanks are typically installed with level sensor which are suitable for all explosion resistant Class 1, Division 1 environments.